Last September, two new Banksy murals appeared in the London area of the Barbican Center. How does MI KITSCH KITCHEN know that these interventions were made by Banksy? Because, both of them, were hung on his Instagram. It is the new formula Banksy choses to authenticate his work. Boy and dog in a Johnnypump by Jean-Michael Basquiat painted in 1982 were plastered on a stencil and painted on a wall with two cops putting a boy down. But, oh là là! The world is full of surprises! The intervention of Banksy was recently intervened by a new unknown graffiti artist. An elongated figure, a skater jumping to crown Basquiat, had appeared alongside the cops. MI KITSH KITCHEN believes this intervention has reopened another new chapter of the fun battle Urban Art vs. Graffiti, isn´t it absolutely great? 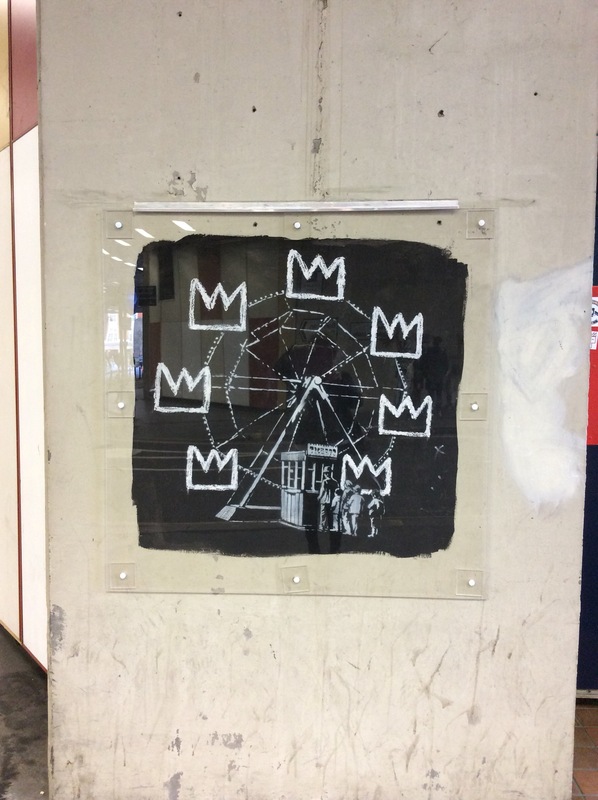 Opposite, on the other side of the street, a second intervention of Banksy honoring Basquiat remains still unaltered, a big wheel with crown-shaped wagons and a queue of people waiting for their turn to get on. Major new Basquiat show opens at the Barbican (a place that is very keen to clean any graffiti from its walls). However, although Banksy painted both pieces in the heart of the Barbican Center they have not been erased; strangely, they have been protected by methacrylate screens. Dear reader, Barbican is a super cool and multipurpose center located in central London that has almost everything, cinemas, theater, restaurants and a very cool contemporary art gallery, where from September 21th to January 28th they will exhibit Boom for Real, a retrospective of Jean-Michel Basquiat. Warning! The ticket to the exhibition is not free, it is necessary to pay £16. -Who is Jean Michel-Basquiat? “Asks the tortured writer while he took a heart-shaped puff pastry of the pantry-Is not so much money to see a contemporary artist? Jean Michael Basquiat was a New York graffiti artist who wrote the most puzzling signs of the cultural boil of Manhattan’s Lower East Side in the 1970s. A time where hip hop, post-punk and street art movements were merged. With twenty years, he exhibited paintings cataloged as neo-expressionists in the most important galleries and museums of New York, and in 1992 The Whitney Museum of American Art realized a retrospective of his work. Basquiat died young, in 1988 due to his addition to heroine, he was 27 years old. The storytellers of the art world, told us, that a morning, Basquiat was walking with a friend and he saw Andy Warhol through a restaurant window, and he came into and went straight to the table where the famous artist was eating, introduced himself and sold Warhol a picture for a few dollars. 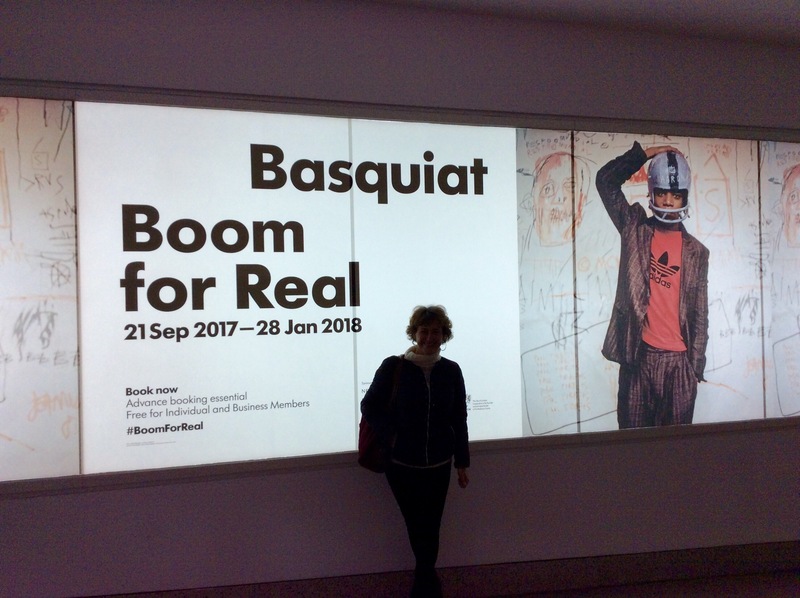 Some years later, in 1984, when Basquiat was already famous like a DJ, he would perform, together with Warhol and Francesco Clemente, one of the most important collaborations of the history of Big Art. So, does MI KITSCH KITCHEN recommend to visit Basquiat Exhibition? You may ask again. Of course, if you can, go, even if the Barnican Security doesn´t allow you to take photos to Basquiat works with your iPad without flash, even if you have to bear the intrusive search of Stansted airport after having passed without problems the security arc and the scanner and don´t set off any detector´s alarm. Of course, a visit to Jean-Michael Basquiat is worthy! P.S: Dear reader, in MI KITSCH KITCHEN we are aware that super important dates are approaching, Black Friday and Halloween night. As an editor I have always taken these dates very seriously, and I have them marked with red circles on the Pirelli calendar that hangs on one of the kitchen walls. However I have to admit that I have not decided the horror story that I will post on the blog on the next few days. About two weeks ago the tortured writer appeared in my office with a story about three ghosts who met Cervantes one night when they went for drinks in Tarragona, two days later José Luis, the CEO, sent me and e-mail with a story of his friend of Second Life corrected by evil software, and yesterday FOC-TEA, the exorcist, gave me a remastered cassette with his last summer adventures, where he appears hunting transalpine vampires in the unexplored Sierra de Gredos. Previo ¿Por qué el arte no puede ser diversión? Siguiente ¡Ostras! ¿Quién narices es William Kentridge?